Most of us have carpets in our homes and we want to keep them clean. There are many ways to do so. We’ll discuss what we consider to be the best method for carpet cleaning. In our opinion, if you want to achieve the best results for carpet cleaning, truck mounted steam cleaning is the way to go. This method is also known as the hot water extraction methods. This type of carpet cleaning employs equipment which is typically mounted in a vehicle which delivers hot water and cleansers through a hose. It is applied to your carpet and then extracted through a strong vacuum. 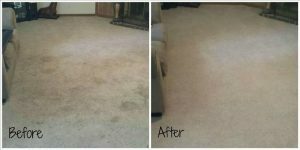 The steam cleaning method is the best way to clean down into the fibers of your carpet. It can therefore get out deep down dirt, grime and contaminants. This is especially important in keeping the spread of infection to a minimum. If you have young children who crawl on the floor, this will be an important consideration. You should be aware that most of the largest carpet manufacturers endorse and recommend the hot water extraction method. In some cases it is even required to keep your stain and wear guarantee in force. Therefore when considering to have your carpets cleaned, you should seek a company which uses this method. The company which invests in this type of equipment is very committed to provide you with the best possible results. And you can be comfortable with the fact that your carpet will be cleaned in a very effective, safe, and reliable manner.